There is a time when an artist that has been wildly driven by a favorite idol, could be rendered as more than merely an influential character, which some would bad mouth claim that a copycat is in the house. However, this artist is actually a craftsman at work that is able to go beyond the abilities of his long-lasting mentor. Thus it would appear that the only way available for the Swedish Traditional Metal and RUNNING WILD feverish fan, Cedrick Forsberg, is up in the ladder towards achieving greatness. Hailing with album number four, “Down In The Dark”, via Stormspell Records, while also keeping under leash his previous album’s vocalist, Erik Forsberg, to not tread anywhere else, the BLAZON STONE project stepped up as none other than a bloody mighty Metal force to be reckoned with. Referred to as Pirate Metal, or simply melodic Heavy / Speed Metal, the amounts of vigor that seemed closer to explode within “Down In The Dark”, are almost out of this world. 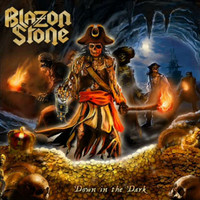 BLAZON STONE unleashed a kind of enthusiasm and musical energies that somewhat left the old German titans with dust in their mouths, and I speak of the band’s late 80s and early 90s eras, which I have always deemed as their classic years. Furthermore, it once again proved the songwriting qualities of Cedrick Forsberg, which might have sounded similar to past relics of his idols, yet the near perfection values overcame the analogies. Moreover, Forsberg’s on each of the instruments played is surreal, especially by coming up with a slice of smacking riffs, obliterating guitar solos and extensive double bass action on the skins. The preservation of Erik Forsberg appeared as one of the album’s keys to success. Discounting the fact that he sounds like a younger version of Rolf Kasparek, he virtually put out another dimension of his voice, assimilating to the aggressive manner of the music around him. It is a sheer pleasure to listen to him sing. In overall, I found “Down In The Dark” as one of the most easiest albums to digest, a rapid journey through astonishing melodies and fast paced drumming that barely ceased to take a breath. “Hanged, Drawn, and Quartered” is my first choice as a Heavy Metal hymn, a true hard riffer, headbanging pleasure dome of no other. Ounces of Speed Metal portrayed in “Down in the Dark” and “Merciless Pirate King”, it would be difficult not to get attached to the addictive choruses and freedom which the songs channel. In the spirit of the 80s, rises up “Rock Out!”, as if it was a tribute to Metal’s golden age, it raptured with a fine mid-tempo beat, bearing impressive riffery. Last but not least, there is the closer, “Captain of the Wild”, surging with a smoothly catchy chorus, blasting rapidly right before nailing the last nail on the coffin. “Down In The Dark” is one of those albums that I can sit and listen all day, it is highly enjoyable, would make you hurt your neck with all the demands for headbanging all around. Such devotion, spanning for almost five years, is a thing of beauty and utter passion, especially when it is used for a good purpose. This one is a definite buy.